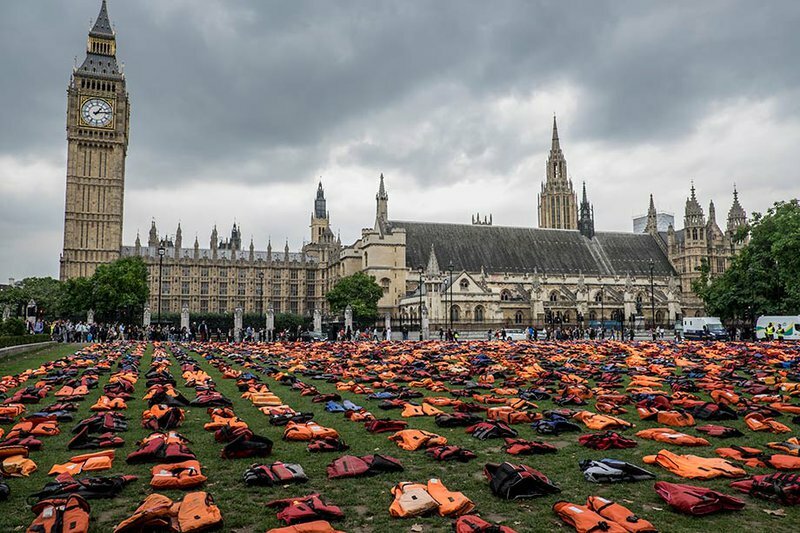 Lifejackets that have been used by refugees to cross the sea to Europe are laid out in Parliament Square on 19 September 2016 in London, England. NurPhoto/SIPA USA/PA Images. All rights reserved. As Britain heads into negotiations with its European counterparts many issues will be on the table. In the public discussion, at least, two of these have been key: access to the single market and freedom of movement between EU member states and the UK. But while immigration is a crucial issue, the question of how access to asylum will change following Brexit remains under-discussed. This is odd, given how effectively the Leave campaign use the ‘refugee crisis’ in 2015 to argue for stricter border controls and – ultimately – for a British exit from the European Union. If asylum seekers are part of the issue that has led the UK to leave, what will the UK now do in relation to asylum policy? The British government has a long history of seeking to restrict access to the right to asylum in Britain. This is evidenced by their treatment of asylum seekers arriving over the border from Calais, as well as by the detention centres they operate for asylum seekers who have had their claims rejected. Now that Article 50 has been triggered, will the UK government continue with this approach, or will it change tack to become more or less restrictive? Will Brexit affect the UK’s (already weak) commitment to the Geneva Conventions on the Status of Refugees? The large scale movement of Syrian citizens and others that began in 2013 opened up a critical debate between the UK and its European counterparts. Some European countries agreed to burden sharing, whilst the UK refused, with former Prime Minister David Cameron pledging instead to resettle 20,000 Syrian asylum seekers by 2020 directly from camps in Turkey, Jordan and Lebanon. Described as a mass immigration crisis similar in scale to that experienced at the end of the second world war, it was expected that EU leaders would come together to create a practical solution for managing the influx. As ‘a global Britain’ begins once again to write its own trade agreements, the UK needs to carefully consider if and how it will include migration management and border security within them. Instead, EU leaders gathered with policies and pre-conditions in hand, some oriented around maximum numbers of new admissions while others simply beat the rush by closing their borders entirely. They met again in Malta in 2015 with officials from Africa to negotiate modes of cooperation for stopping migrants reaching Europe from Libya. This deadly journey across the Mediterranean sea continues to claim hundreds of lives each month, yet the British government continues to oppose rescue operations in the area on the argument that creating ‘a bridge to Europe’ only gives migrants additional incentive to attempt the journey. Within this context the EU has put financial incentives on the table in exchange for containment, however so far nothing has been concluded. EU members have also sought to establish bilateral agreements with African countries independently. The Khartoum Process for example, is an agreement with the Sudanese government which provides the Sudanese government with funds in order to deal with the immigrants crossing to the Libyan border. It’s a devil’s bargain. The Khartoum regime, led by President Omar al-Bashir, is well-known for its corruption and extensive human rights violations. President al-Bashir himself is wanted by the International Criminal Court (ICC) for genocide and crimes against humanity in Darfur, Nuba Mountain, and South Kordfan. As ‘a global Britain’ begins once again to write its own trade agreements, the UK needs to carefully consider if and how it will include migration management and border security within them. This is especially true when dealing with pariah regimes known for killing their own people, such as al-Bashir’s. Any agreement will fail to fit its purpose if it leads to further displacement in refugee camps and more individuals risking the deadly journey through the Mediterranean Sea. Another point worth focusing on is the consequence of Brexit for refugees and asylum seekers who are already in the UK. Whilst we can almost certainly expect increased border control as a result of Brexit, we should not let the UK forget its historic values in welcoming asylum seekers and refugees. UK policy makers should see asylum seekers for what they are: individuals fleeing persecution under the protection of international law; and as future contributors to the UK economy rather than as abusers of the welfare state. Finally, Brexit has no doubt had a major impact on asylum seekers and on the asylum process. British officials have also been clear about their attention to withdraw from the European Convention on Human Rights and establish its own bill. How this will play out is as yet unknown, but it has the potential to disadvantage asylum seekers and remove any chance of recourse to the European Court of Human Rights. To prevent such a slip away from substantive protections for asylum seekers, it is imperative for the government and civil society advocates to push back against the growing culture of disbelief towards asylum seekers and maintain their ability to access asylum in the United Kingdom.